A nationally and internationally known yacht surveyor, Holaday was a U. S. Navy veteran who served aboard the submarines USS Tusk and the USS Angler during the Cold War. He attended the University of Connecticut, the University of Rhode Island, Mitchell College, Middlesex College, Suffolk University Law School, Three Rivers College and the Westlawn School of Yacht Design. 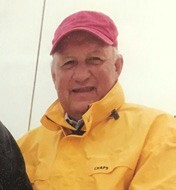 He received a Masters Degree in Marine Surveying from the State of Connecticut and held a U. S. Coast Guard license for over 40 years. Additionally, he spent many years as a service/yard manager at several marinas in southeastern Connecticut. Holaday was a member of The National Association of Marine Surveyors, a charter Member of The Society of Accredited Marine Surveyors, The Society of Naval Architects and Marine Engineers, U. S. Submarine Veterans, Noank Historical Society, Connecticut Society of Genealogists, The New England Historical and Genealogy Society, Life Member of the Noank Fire Co., and a member of several local yacht clubs. He enjoyed sailing, golf, jazz, Civil War history and genealogy. He and his wife Maryanne visited England many times researching his family lineage, and made many friends there. Holaday’s son, Dexter A. Holaday II, will be continuing his father’s marine surveying business, founded in 1971.